Abdalla Bani, AE’13, Tyler Martin, AE’13, and Fabrice Tine, ME’13, AE’13, all overcame adversity to make it to college. Despite the challenges they faced, each of them earned a degree from Missouri S&T. 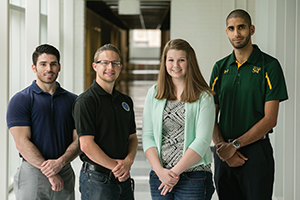 Now they are helping other S&T students who face adversity to achieve the same success. From left: Tyler Martin, Dylan Prévost, Katherine Bartels and Abdalla Bani. Not pictured: Fabrice Tine. The three were part of a group that formed Team Orion during their aerospace engineering senior design class, where they raised more money than needed for their project. With the extra money, Bani, Martin and Tine established the Pursuit of Life Scholarship to give a financial boost to an S&T student who has struggled like they did. Bani, now a graduate student in mechanical engineering at Missouri S&T, relocated nearly 6,000 miles, from Tripoli, Libya, to attend school. His homeland soon entered civil war and revolted against Muammar Gaddafi, leaving Bani to constantly worry about his family. Tine moved from his homeland of Périgny, France, to attend S&T. He had to adjust to a different culture and learn engineering in a whole new language. Martin was homeless as a teenager. During high school, he got a job and started saving his money. When he decided to become an engineer, he founded his own personal training business to support his education. Initially, the group planned to offer one $500 scholarship. That changed, however, once they read through the applications. Students were required to include an essay describing the adversity they faced and how they planned to overcome it to achieve their goals. This past fall, Team Orion awarded the first Pursuit of Life scholarships to Katherine Bartels, a sophomore in environmental engineering, and Dylan Prévost, a senior in nuclear engineering. The team hopes to offer the scholarship again in the future and gradually grow the amount they can offer, says Bani.